On a recent Sunday evening we had some neighbors over for dinner. Really, they are our friends who happen to be our neighbors. We are lucky enough to have numerous neighbors who we call friends. That night we decided to make steak and corn on the grill with some buttery dinner rolls. Our neighbors, Scott and Meghan, brought blue cheese and rosemary mashed potatoes (delicious!) and fixings for chocolate mint milkshakes for dessert. 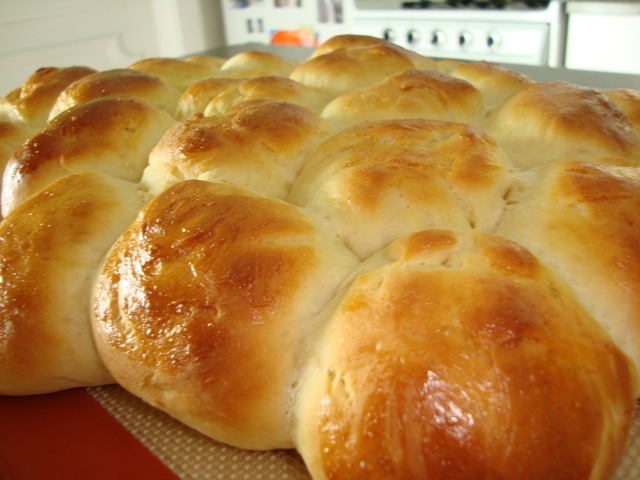 While everything we ate that night was wonderful, I have to say (in my humble opinion) that the dinner rolls were the best! Scott, who once called himself a “bread whore,” ate four. The rolls were rich and dense and nearly melted in my mouth. Visit http://summerofbread.com/2010/07/neighborly-bread/ to read more!